Minutes of December 9, 2014 meeting were accepted. Financial – Jim Brosnan reported a bank balance at the end of 2014 of $1771.48. Andy Marussich turned over to the park, some (very old) artifacts that he had found: coins, a belt buckle, and shoe buckle. They are displayed in a small case. Brian Strasavich reported that the service road (the white trail) is closed because of icy conditions. The playground is also closed because when the wood chips freeze, they become like concrete and are unsafe. Ice skating and ice fishing in the reservoir behind the pool is permitted now that the ice is 6” thick or more. The DEC will be checking on the white cedars near Crompond. The FDR staff is dropping hazardous trees. Permits to remove dead trees already on the ground for firewood may be obtained at the park office (they are free). Bedford Audubon had expressed an interest in building bird houses and locating them near the edge of the woods across from the walking entrance to the swimming pool. These boxes need to be cleaned out at least once a season and should be peeked into every week. We don’t have the manpower to take on this ongoing project, but if we could find volunteers to monitor the boxes, it could be a viable project. Anwer will post on Facebook. Maria Adams and Anwer Qureishi agreed to review the by-laws with Jane Daniels. Melissa Cole suggested that “geo-caching” (treasure hunting) is permitted in the park (and Brian acknowledged same), and maybe that would be something we could promote or get involved in. Check it out on www.geocaching.com. It is a very family friendly activity. Mark Kotkin is helping with content on the website. He asked who the website is for and said that by answering that question, the site can be improved, and easier to use. He will review the site and talk with Jane and Walt Daniels. We will all forward pictures taken by us in the park previously to Anwer, so that there is a variety to post on the web. I Love My Park Day is Saturday, May 2. Brian hopes to have picnic tables to assemble. He also mentioned that tree planting, and distributing wood chips, especially on the disc golf course, and the picnic area at parking lot 5, are possible activities. We would also like to continue vine cutting. We should make sure that the disc golfers will be there to help, i.e. for spreading wood chips on the course. Brian thinks that about 100 disc golfers rotate through the park on a regular basis. Vine cutting with a church group who had contacted Volunteer New York is set for Sunday January 18 from 10-12. The group is to continue moving counter clockwise around the swimming pool parking lot. 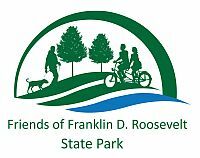 Maria Adams will set up a table with sign in sheets, pencils and other information about us, including the Volunteer Service Agreements which should be signed for the park. Mark Kotkin, Dianne and Peter Press, John Robinson, and Maria Adams will be working with the group. At events like this, we should always obtain the names of the leaders of the volunteer group for future contact, or rescheduling/cancellation of the event. Dianne is in contact with Bedford Audubon about a bird walk. They liked the idea of doing the walk at the Indian Hill Section of Trump State Park and suggested doing it in June. She will follow up with a date. Jane talked about National Trails Day, June 6, and that working on the bridges is likely to be possible. Building a bridge is attractive to many people and it will help raise our profile. Concern was expressed about the group knowing what to do. Jane reassured everyone that you don’t need to know how to hammer a nail. She will be meeting with Linda Cooper, regional director, Brian and two of his staff members on January 22 to discuss implementation of the grant. Brian says he has a shed available which he can loan to us during the bridge constructions projects. He also has a good spot for us to put it up. It may be a nice idea to schedule some type of “walk” in mid to late June, as our third walk after the First Day Hike, and the Bird Walk in April. Whether to continue selling T-shirts will be discussed at the next meeting.